With an 8-4 record and a sparkling 2.22 ERA, 25-year-old Emory Nicholas “Bubba” Church had enjoyed an outstanding rookie season for the 1950 Philadelphia Phillies as he took the mound in the first game of a doubleheader against the Cincinnati Reds on September 15 in Shibe Park. While not earning a decision this day, Church would become its central figure in a contest that would have lasting impact on the Philadelphia pitching rotation for the final weeks of the regular season and the World Series. With one out in the top of the first, Church pitched himself into trouble with consecutive walks to Grady Hatton and former Phillie Johnny Wyrostek. Church now had to confront the muscle of the Cincinnati batting order in the hulking presences of Ted Kluszewski and Joe Adcock. Combined, they would hit exactly one-third of Cincinnati's 99 home runs in 1950, but Church initially bettered them by retiring both on fly balls to the outfield. Veteran Willie Ramsdell started for the Reds. Cincinnati had just two 30-year-old pitchers, Ken Raffensberger (32) and Ramsdell (34). Ramsdell “was sold to Cincinnati on May 10, reportedly for around $20,000. At Cincinnati Ramsdell began as a reliever but ended up as a starting pitcher. … [S]coring runs was a problem for the 1950 Cincinnati club; Ramsdell was one of the primary victims as the sixth-place Reds were shut out in five of his twelve defeats.”1Ramsdell enjoyed little run support on this day, too, but pitched well in a complete-game effort. Like Church, Ramsdell had two batters reach against him in the first inning on a leadoff single by Eddie Waitkus and a walk to Del Ennis, but also like Church, Ramsdell pitched out of trouble. This pattern continued in the second inning. Cincinnati got singles from Lloyd Merriman and Johnny Pramesa to start the frame, but Church got Virgil Stallcup on a fly to Ennis in right before facing Ramsdell, who would hit .200 with the Reds with 10 hits in 1950. Ramsdell lined out to Mike Goliat, who flipped to Granny Hamner at short to double up Merriman off second and keep the game scoreless. The game did not stay scoreless for long. Hamner and catcher Andy Seminick both singled to start the bottom of the second, with Granny going to third on Seminick’s hit. Goliat flied out to Merriman, scoring Hamner, although Merriman threw out Seminick trying to take second. Church grounded out to end the inning with the Phillies up 1-0. Manager Eddie Sawyer brought in lefty Ken Heintzelman, who four years earlier had his own similarly scary accident when he “was hit on the jaw by a vicious drive off Sid Gordon’s bat … and … was carried off on a stretcher.”5 Overcoming this tough memory, Heintzelman got Adcock to fly to Ennis to retire the side. Richie Ashburn walked in the bottom of the third, and Pramesa got his second single in the top of the fourth, but neither team scored again until the bottom of the fourth when Seminick’s 23rd homer of the year, “a rousing drive into the upper deck of the left-field bleachers,”6 put the Phillies up 2-0. 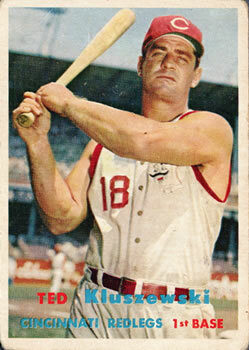 After a 1-2-3 bottom of the fifth, Cincinnati rallied in the top of the sixth with Kluszewski leading the attack with his second single of the game. Adcock hit a comebacker to Heintzelman, who got the lead runner at second. Merriman, too, hit into a fielder’s choice, and Pramesa’s third hit of the game, one short of his career high of four (established the previous month) put runners on the corners with two outs. Stallcup doubled in Merriman, but catcher Pramesa stopped at third, a key play in a one-run game. Trailing 2-1, Ramsdell hit for himself and flied to Ennis to end the inning. Only three hitters reached the rest of the game, and each did so with two outs. Goliat singled in the bottom of the seventh, but Philadelphia manager Eddie Sawyer, perhaps thinking ahead to the demands that the nightcap might place on his battered pitching staff, let Heintzelman hit, to no offensive avail. Jones walked in the bottom of the eighth, but Ennis fanned. 1 John Stahl, “Willie Ramsdell,” sabr.org/bioproj/person/b12cbf39 (accessed May 14, 2015). 2 Robin Roberts and C. Paul Rogers III, The Whiz Kids and the 1950 Pennant (Philadelphia: Temple University Press, 1996), 290. 3 John Webster, “Misfortune Strikes Phils; Batted Ball Injures Church,” Philadelphia Inquirer, September 16, 1950: 15-16. 4 Associated Press, “Phils Win in 19th after 2-1 Triumph,” New York Times, September 16, 1950. Church started just two more regular-season games in 1950. He lost both and gave up 12 runs (10 earned) in less than six total innings. Church did not appear in the 1950 World Series. 5 Louis Effrat, “Giants Drop 2 to Pirates, 2-1, 5-1; Ott Banished From Both Contests,” New York Times, June 10, 1946. 6 Lou Smith, “Phil Hurler Felled By Ted’s Liner; Reds Lose Final In 19 Innings, 8-7,” Cincinnati Enquirer, September 16, 1950: 15. 7 “When the fighting ended, the Army found a more fitting use for [Ewell] Blackwell’s talents: pitching for the division baseball team. His teammates included major leaguers Harry Walker, Johnny Wyrostek, and Ken Heintzelman.” Warren Corbett, “Ewell Blackwell,” sabr.org/bioproj/person/99b3d493, (accessed May 20, 2015). 8 Litwhiler would post a career .340/.404/.660 slash line off Heintzelman in 47 at-bats with three doubles and four home runs, according to incomplete data available at retrosheet.org/boxesetc/H/MU1_heink101.htm (accessed May 19, 2015). 9 Stan Baumgartner, “Phils’ Bench Gets Its Chance, Proves Stouter Than Figured,” The Sporting News, September 27, 1950: 4. 10 All three of Heintzelman’s 1950 wins came in the first games of doubleheaders. He would appear just twice more during the regular season, both in starting roles, beating Warren Spahn and Boston 12-4 in a September 25 complete game and, on just two days of rest, losing to New York 3-1on September 28. 11 Stan Baumgartner, “Phils Win, 8-7, in 19th To Take 2; Church Hurt,” Philadelphia Inquirer, September 16, 1950: 1.